The lowdown: To boil it down to its essence, yerba mate is like a tea: Flavor from a dried loose herbal leaf is extracted using hot water. But that’s a little like comparing a toiled-over cappuccino to instant coffee, for yerba mate is much more than bagged tea you’d find in the office pantry. It’s a ritual more than anything, its leisurely consumption following a lengthy preparation process. Yerba mate is an experience. I first drank mate in Argentina, where the beverage is a national pastime and a daily practice for most locals. It’s also popular in much of southern South America, especially Uruguay, where public areas have hot water fountains for the explicit purpose of mate making. It’s gained popularity in Syria and Lebanon, where immigrants to South America took it home on visits—Syria is one of the largest importers of mate from Argentina. In the cities of Argentina it’s common to see people walking the streets with large thermos containers expressly for making mate, or drinking it at their leisure on breaks from work or school. It would go something like this: In the early afternoon on a Saturday, I’d meet my friends in the park. One or more of us would bring all the necessaries for mate: a large thermos (termos) filled with hot water, heated until just before boiling; the gourd, or spherical cup designed specifically for mate; the yerba itself packed in a yerba-only container; and the bombilla, a type of metal straw that acts as sieve. (Pronounced “bombisha.”) All of this is packed into a handsome bag designed for carting this paraphernalia around (a “porta termo”). Once settled on a good patch of grass or park bench, the person in charge of the mate would assemble it. This involves putting a relatively large quantity of the bright green leaf in the bottom of the gourd—filling it between two-thirds and three-fourths of the way full—placing your hand over the mate, and enthusiastically shaking it so the leaf hits your hand. The fine powder sticks to your skin, which you brush away, as this powder is undesirable. When this is done, the yerba leaf is tilted to a steeply sloped angle and a small quantity of water is added from the thermos. Cold water is preferable, if you’re at home, but for the mate drinkers out and about, hot water from the thermos has to do. Just a little bit is added—enough to saturate the leaves, but not so they’re swimming in water. Then the bombilla is inserted, sieve end stuck in the wet leaves, also at an angle so that it is firmly in place. You don’t move the bombilla now. At this point you can add enough hot water to extract flavor from the leaves. The slope of the yerba mate has to be maintained, so that there’s some dry leaf at the top that will slowly get added in as you go. The traditional mate cup is small, and only a bit of water is added and drunk at a time. It should be gone within a few sips. The mate is refilled again and again, passed around to each friend in turn. The strong flavor combined with the sloped technique allows for nearly countless extractions, so even sip 30 is strong and satisfying. Like coffee in the U.S., mate habits vary by region, family, and individual. Some drink it in the morning for its boost of caffeine, but it’s most commonly seen in the late morning and early afternoons. In my Argentinian family, we’d often drink it after lunch in the summer or during the school year, when we returned home from class. It acts as an appetite suppressant, which goes some way to explaining the ease with which Argentinians go from a 1 p.m. lunch to a 10 p.m. dinner. And although the social aspect of mate gets much of the attention, it’s acceptable to drink it solo. Just beware of consuming too much—upon return to the U.S. I unthinkingly replicated mate preparation as I had in Argentina, which is meant for a small group of people. Taking an entire thermos of mate yourself is way too much caffeine, like sipping three cups of coffee on your own over an hour. The taste: True yerba mate has a very strong, earthy flavor. Some may call it bitter. It can be overpowering at first, and (like coffee) may take a while to build up a taste for it. When I first encountered it I thought it was way too strong, and the discarded wet leaf in the trash made me feel nauseous. But I tried it—if you’re in Argentina or anywhere in South America where mate is ubiquitous it’ll be hard to avoid—and grew to love it. It is acceptable to add sugar to your mate to sweeten it, though some will give you grief for it. On sweltering summer days we’d replace the hot water with ice-chilled lemonade, which sounds like it would clash with the strong, bitter tea flavor but makes it pleasant and mellow and especially refreshing on a hot afternoon. Possible gateway: Yerba mate entered the U.S. beverage market a few years ago, and now grocery store shelves bear witness to the drink in a very diluted form. But if you’ve never tried mate before, the overpriced glass bottles found at upscale grocers make for an accessible entry point. They’re never as strong as the real thing, but give you an idea of the flavor. The other product you may have noticed is an energy drink. That’s because yerba mate contains more caffeine than most tea. But like all flavors added to energy drinks, it’s a bastardization of the product, not a showcase for it. Some coffee and tea shops sell the leaf, either loose or in tea bags. I’ve heard of coffee shops that make the mate in the gourd with the bombilla, but I’ve never encountered one in the wild. Next steps: Once you’ve decided you enjoy the flavor, it’s time to get the gear and prepare it yourself. 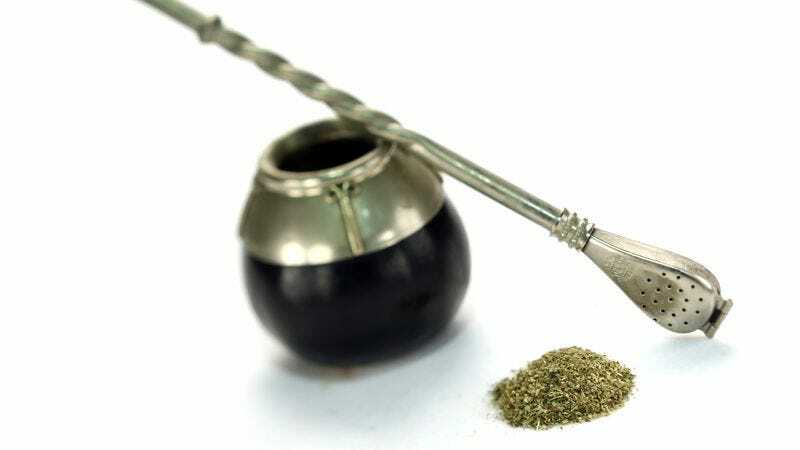 You can order yerba mate sets online, the two absolutely necessary components being the gourd and bombilla straw. I recommend Rosamonte brand yerba mate, not because I’ve tried a bunch and this is the best, but because it’s the brand I used in Argentina and it’s available online. These are large bags that weigh two pounds—you go through it quickly, since you use a lot of leaf each time you drink. To get really into it is to focus on the proper way to drink it in a group. There are rules about the bombilla—it should be pointed back toward the person you’re handing the mate to—and you don’t rearrange it once it’s been in the mate, or even really touch it. Some people in South America will tell you what it means to drink the first sip, the last sip, and so on and so forth. This sip will be the first to marry, that the first to die, etc. Talk like an expert: ¿Quieres tomar mate? I’ll grab my termos and meet you outside.